In collaboration with BPI Foundation, Globe Telecom integrates into the BPI Sinag Accelerate Program the “Tech For Good Award” which will be given to the social enterprise that best displays effective use of digital technology in its project. 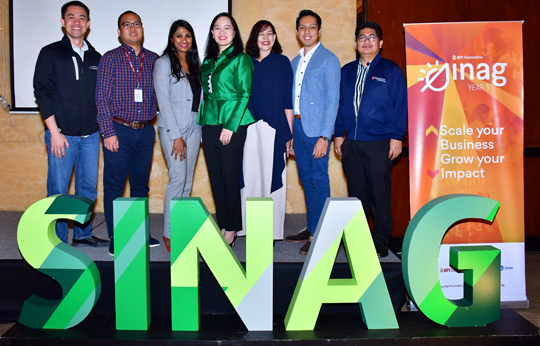 BPI Sinag Accelerate is a business plan competition that seeks to identify, support and recognize existing social enterprises who are ready to scale up and create deeper impact. The call out for entries is from April 4 to May 27, 2019, after which qualified participants will gain access to grants, business boot camps and in-depth mentoring, networks and impact investors. The program will culminate in a final pitch and awarding ceremony on September 13, 2019. “Globe is in the process of creating an ecosystem of social innovators through the Globe Future Makers (GFM) program where we are encouraging the country’s start-ups to use technology to solve the Philippines’ most challenging social problems. By partnering with BPI Foundation, we hope to expand our GFM community by including their network of social enterprises” said Yoly Crisanto, Globe Chief Sustainability Officer and SVP for Corporate Communications. To qualify for the “Tech for Good Award”, the social entrepreneurs must be 18 years old and above who are equally passionate about business—scaling-up and expanding—and making a difference. The social enterprise must have social impact as the primary driving force for its initiative and must have a clear idea of which social problem they are solving through the use of technology, as well as their target communities. The group must also be ready to establish their program outside Asia Pacific, thus, the technology or solution must be accessible, replicable, scalable, and sustainable in the selected country or countries.